"Boston Cream Pie" Cake - Let the Baking Begin! 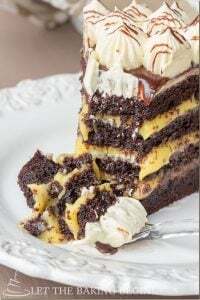 Boston Cream Pie Cake – light and airy sponge cake, layered with custard and topped with chocolate ganache. Very simple combination of custard and sponge cake, but a classic and always tastes amazing! Here’s what the Wikipedia says about this absolutely delicious cake. A while ago, I wanted to put a collection of cakes together, all made with a common ingredient – sponge cake. I think there are some recipes that every home baker should know and should be able to make. First one, is the sponge cake. 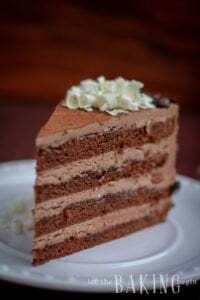 As versatile as it is, you can make dozens of different cakes if you know just one cake recipe, by pairing it with different fillings like, cheesecake, mousse, chantilly cream, buttercream, chocolate buttercream, Bavarian cream, and others. Original recipe of the sponge cake calls for eggs, flour and sugar only. My recipe calls for a very small amount of baking soda, which makes an already foolproof recipe even more foolproof, and some butter & water. The butter & water produce a moist, but not at all heavy cake that if used with a cream like the patissiere cream, does not need to be soaked with syrup. The second recipe that I think every baker should know is the bavarian cream or custard cream. 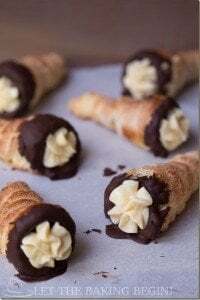 This one is also used in variety of recipes, a couple of which include the éclair, profiterole, Boston cream pie and napoleon. Because of it’s mousse-like consistency, it is very fluffy, yet not dense at all. This is just one of the variations of custard creams and it is important to know how to make it. I wanted to share one of the tricks to get your cakes evenly baked, without the dome every time. I used to hate that I would bake a cake and then have to cut off part of it, to provide for a leveled cake. I don’t even remember how I found out about these, but I have been in love with them ever since I first got them. No more bump, no more wasted cake. What you do is, you use these “cake strips” that are strips of oven proof material which needs to be wet before you put them around the pan, so when the cake bakes, the heat does not strike the sides of the pan first, allowing it to bake from the bottom up, instead of baking from the bottom and sides first. This yields to evenly baked cakes, ever time. Magic, I tell ya! You can click on the picture to see it better. Blueberry Scones – The best blueberry dessert recipe. Very Berry Panna Cotta Recipe – Layered of vanilla pannacotta and berry layers. 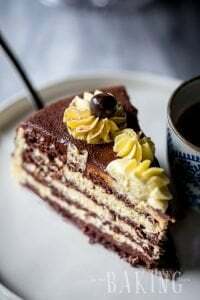 Tiramisu Log – Simple tiramisu recipe. Preheat oven to 350 degrees F. Line two 8 inch baking pans (2 inch tall) with foil, pressing the foil tightly against the inside of the pan so that it conforms to the pan (you can use one 9 inch pan, with 3 inch tall sides, instead of 2 pans). Spray with non stick baking spray. Put the cake strips around the pans. With a mixer fitted with a whip attachment, whip the eggs until foamy and doubled in size. With the mixer still running on high, start adding the sugar, one tablespoon at a time. Continue whipping until tripled in volume and pale in color, about 7-8 minutes. Meanwhile, melt the butter and with a whisk, mix with water. Once the eggs are tripled in volume, sift 1/3 of the flour & the baking soda into the bowl and with a wooden spoon fold the flour in until almost incorporated, using a “drawing the figure 8” motion. Using this technique add the flour in 2 more additions. Add the butter & water mixture and carefully fold it in, until no streaks of butter/water are seen. Split the batter between 2 baking pans. Once the cake is done, remove from the oven, let sit for 5 minutes then invert onto a cooling rack. Mix 1/4 cups water & gelatin. In a medium sized sauce pan, heat together 1/2 cup milk, 1/2 cup heavy cream and half of the sugar. In a separate bowl large enough for 2 cups liquid, whisk together egg yolks and sugar. Once the milk and heavy cream have come to a boil, slowly add half of the milk mixture into the egg yolks, while whisking the mixture non stop (this is called ‘tempering the eggs’). Now slowly add this egg yolk and milk mixture back into the sauce pan with the rest of the milk, while continuing to whisk. Turn the heat to medium and using a flat ended spatula, mix the custard until it thickens. Do not bring it to boil (it will curdle). You know that it’s thickened when you can dip a wooden spoon into the custard, then run your finger on the back of the spoon and the streak where you swiped your finger stays clean (the custard does not run back onto the ‘swipe’). Remove from the heat. Add the water and gelatin mixture and mix until the gelatin has dissolved, about 2 minutes. Run the custard through a fine mesh sieve and allow to cool to room temperature, mixing the mixture from time to time (do not refrigerate as it harden around the edges of the bowl, making for a clumpy cream). Once the custard is room temperature, whip 1 cup cream with a mixer, until soft peaks. Add the custard into the cream and carefully fold it in. Refrigerate the cream for about 10 minutes, folding it with a wooden spoon about every 3 minutes, until it thickens a little. Split the cake with a serrated knife into 3 layers. Place a dab of the cream onto the middle of the serving platter. Place the top layer of the cake, top side down onto the dab of cream. Secure a ring mold around the cake, to fit the cake snugly. 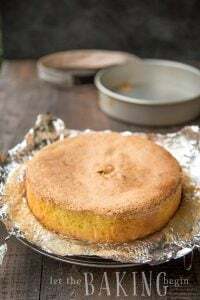 Place a couple tablespoons of the cream onto the cake and spread it out evenly, especially trying to fill the gaps between the ring mold and the cake. Place in the freezer for 5-6 minutes, for the cream to set and prevent the rest of the cream from leaking out the bottom. Put half of the cream onto the cake. Cover with the second layer of the cake. Repeat with the other half of the cream and cover with the last cake, bottom side up. Place the cake in the fridge to set, 2-3 hours. 10 minutes before taking the cake out of the fridge, heat 1/2 cup heavy cream until boiling. Add 100 grams chocolate chips or chopped chocolate. Let sit for 2-3 minutes. Whisk until smooth. Run a hot knife between the mold and the cake to unmold. Pour the chocolate ganache in the middle of the cake. While turning the cake around, smooth the chocolate with a spatula, allowing it to drizzle down the sides. Top with 100 grams raspberry and dust with powdered sugar. 3 Ingredient Sponge Cake - Biskvit - Let the Baking Begin! Is the cream kind of like pudding? If you think custard is like pudding then yes, but otherwise it’s similar but still a little bit different. 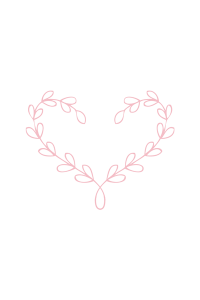 Thanks for reading and making my stuff!! It says heavy cream twice because half a cup is added to the milk and heated, but the 1 cup is whipped up and added to cooked, cold custard. Heavy cream would by any cream with 33% fat content or more. If you use 8 inch baking pan, the layers will just be taller, that’s all. Thanks Claudia for your feedback!